Zoe Lem’s Vintage Wedding Fair has been running from July 2011 and each event has seen hundreds of brides enjoy vintage and vintage inspired wedding services from over 50 suppliers. Next event: LADIES AND GENTLEMEN…IT’S SHOW TIME! 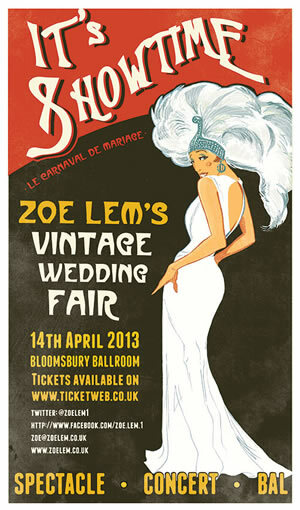 Housed for the first time in the iconic Art Deco venue, Bloomsbury Ballroom on Sunday 14th April 2013, ‘It’s Show Time’ promises to be the event for this year’s brides (aside from THE event of course).